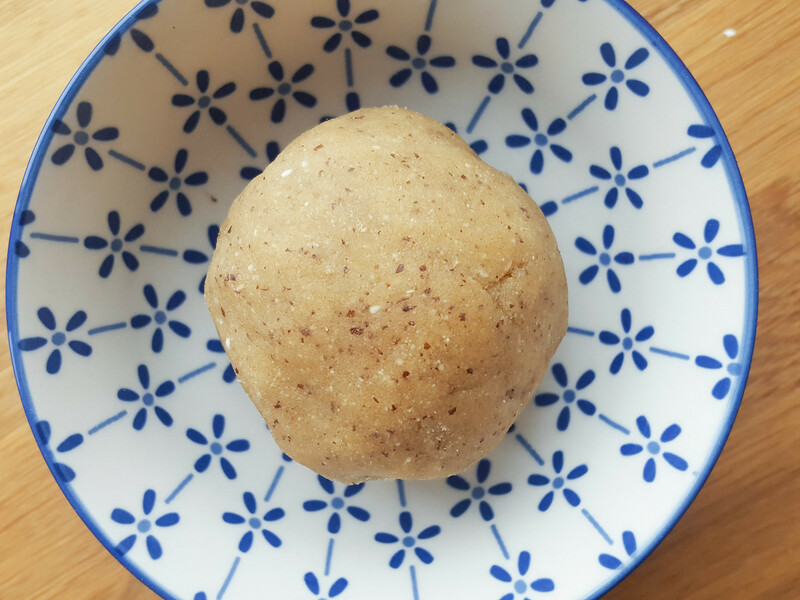 Recipe for Marzipan without refined sugar - Easy to make in 15 minutes! This is a recipe for a homemade marzipan where there has not been added any refined sugar. A traditional marzipan is made from two very simple ingredients; skinned almonds and sugar – super simple but also a bit unhealthy due to the amount of refined sugar. However, this is not an issue because marzipan is normally only used to make candy and cakes where sugar typically is not considered an issue. Even though cakes and other treats normally contains lots of sugar – which is typically the idea with it – it can sometimes be interesting in making cakes which contains less or no sugar, flour, butter or similar. Unhealthy and alternative cake recipes can sometimes be nice to have. If you have a recipe where you should use raw marzipan, and you are looking for a healthy alternative to the traditional marzipan, you can try using the recipe I have shown below. 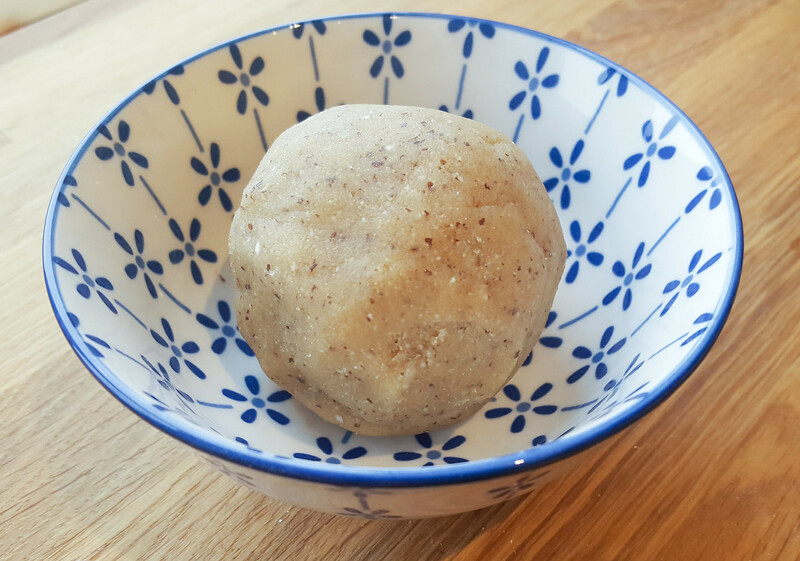 The recipe for sugar free marzipan is super easy to make and it only requires two ingredients; skinned almonds and dates. The almonds are the foundation in all marzipan and the dates has a high content of natural sugar which gives the sweetness to the marzipan. I personally always use this recipe when I am making the sugar and flourless Danish Tree Logs, which are traditional Danish cakes with marzipan wrapped around. You should differently check out this recipe if you do not know it – you can find it here on my blog in the cake section. Making your own sugar free marzipan is super simple. You start by skinning the almonds using very hot water. 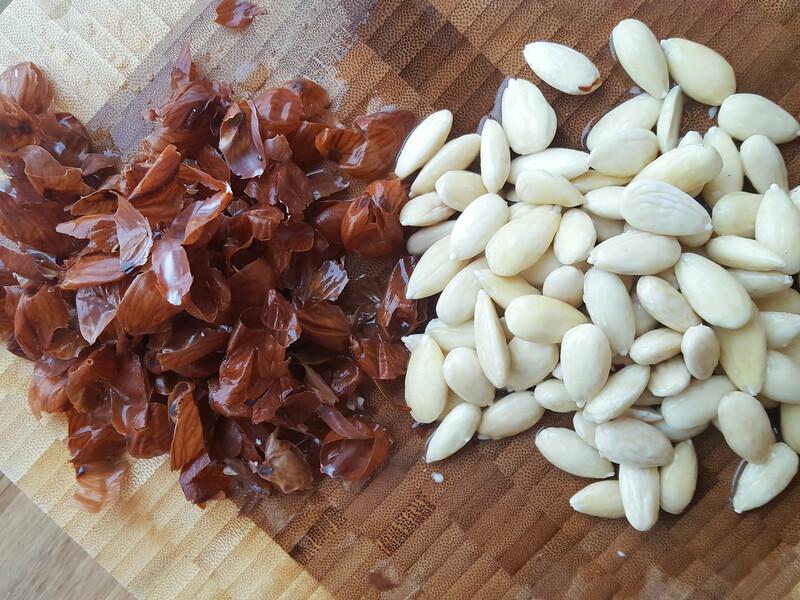 I have a separate guide here on my blog how to skin almonds the easy way. The short instruction, how to skin the almonds is to let the almonds soak in very hot water for about 8-10 minutes and then remove the skin in-between two fingers. 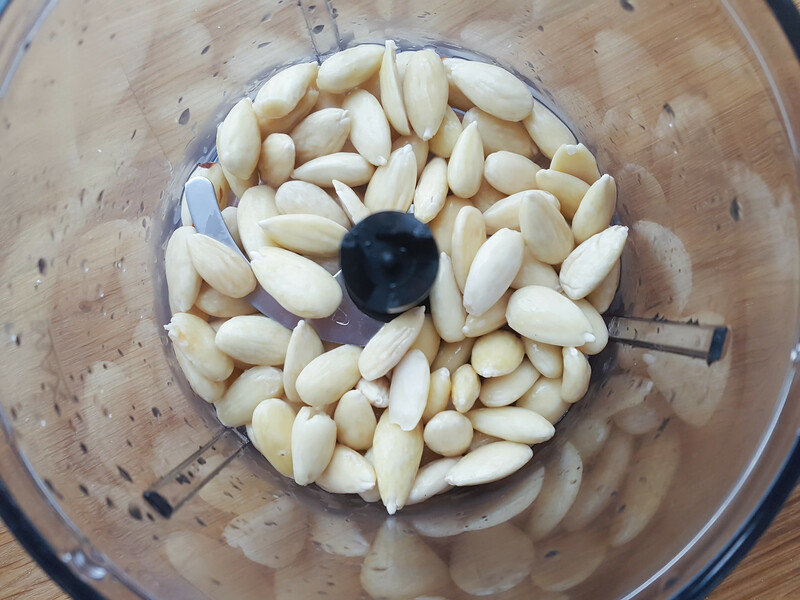 When you have prepared the almonds, pour them in a blender and blend them together with seedless dates for a couple of minutes. Form the sticky marzipan into a ball and let it rest in the fridge for about 15-30 minutes and it is ready. 1. 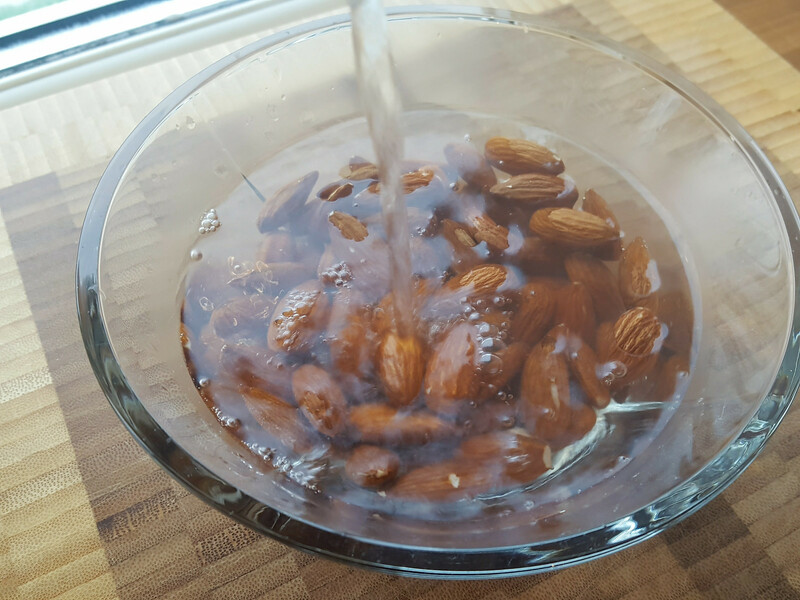 In a small bowl; cover the almonds with boiling water. Set aside for about 7-10 minutes. 2. Using the tip of your finger to easily skin the almonds. This step should be easy. 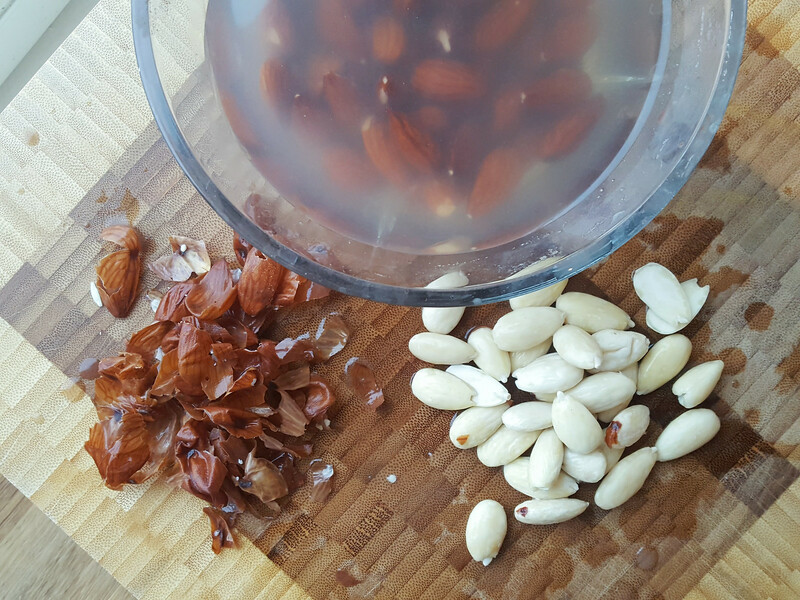 If it is difficult to remove the skin then cover the almonds with some new hot water and let then them soak for another 5 minutes. 3. 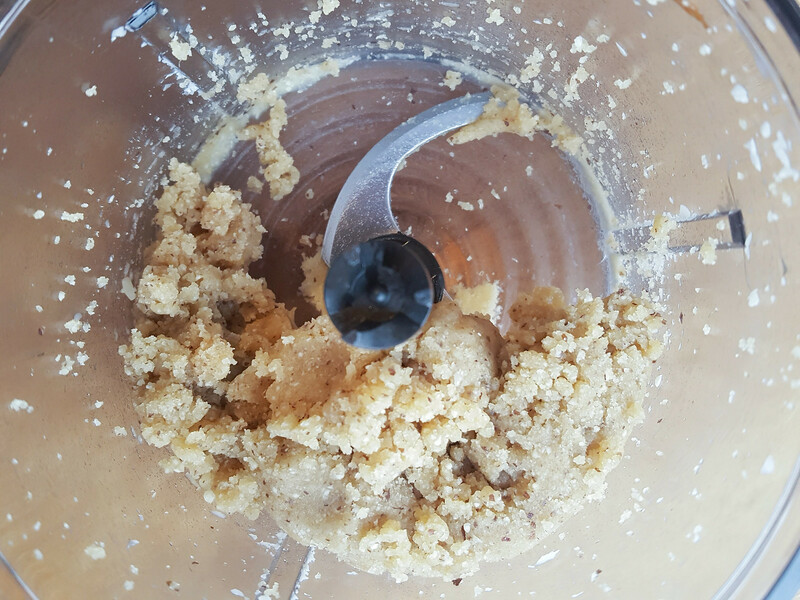 Pour the skinned almonds into a food processor or blender. 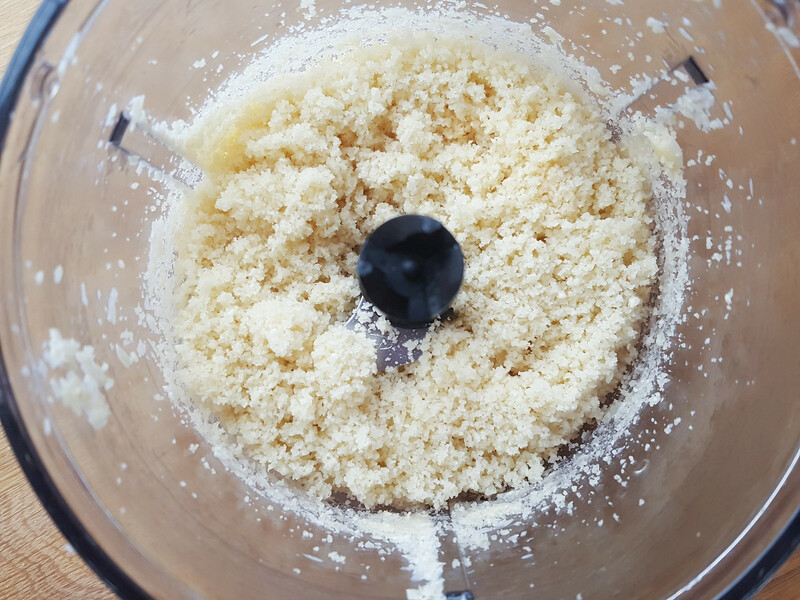 Run on high speed to turn the almonds into almonds flour. 4. Add the stone less dates and run until the almonds and dates are turned into a nice and slightly sticky marzipan. 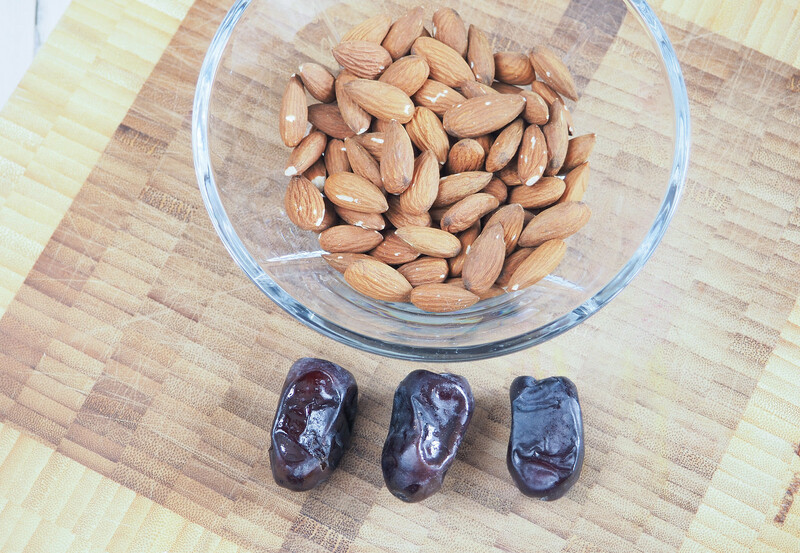 Depending on the freshness of the dates, you might also need to add a little water (about 1 tbsp) to better get the almonds and dates to mix into a nice Marzipan. 5. Cover the marzipan with plastic wrapping and keep it in the fridge until you need it. Sorry, but this is not sugar-free marzipan: it is sucrose-free marzipan. For a diabetic trying to control their condition through diet, this would be a disaster, and would put their blood sugar into the stratosphere Please re-title your page to make it more accurate. Surely any diabetic readers will know this. It says that dates have a very high natural sugar content in the recipe. Besides which, in reference to cakes and desserts, ‘sugar free’ is usually taken to mean ‘no refined sugar’. Calling this ‘marzipan without sucrose’ would be far more confusing to most people. Thanks great recipe, it tasted delicious and like the ‘real thing’. I hate the fact shop bought marzipan contains so much refined sugar so was searching for a simple salternative. This took me a few minutes in a mini blender using shop bought ground almonds, it definitely needed some water to help ot bind together. There is always someon out there to criticise. Hello! Would this marzipan be suitable to use in the kranzekage? I’m in Canada and the store-bought marzipan is poor quality so I’d like to try making my own. I was looking for a no sugar marzipan recipe, read a few but yours looks so simple. Although I generally don’t eat many dried fruits, to be able to make and eat marzipan at Christmas will be great. I stopped eating sugar a long time ago but have got tired of having a piece of fruit when everyone else is eating sweets so thought I’d give myself a treat. I will be making small pieces covered in 100% cocoa chocolate, a ‘healthy’ treat. Thank you for your lovely recipes. 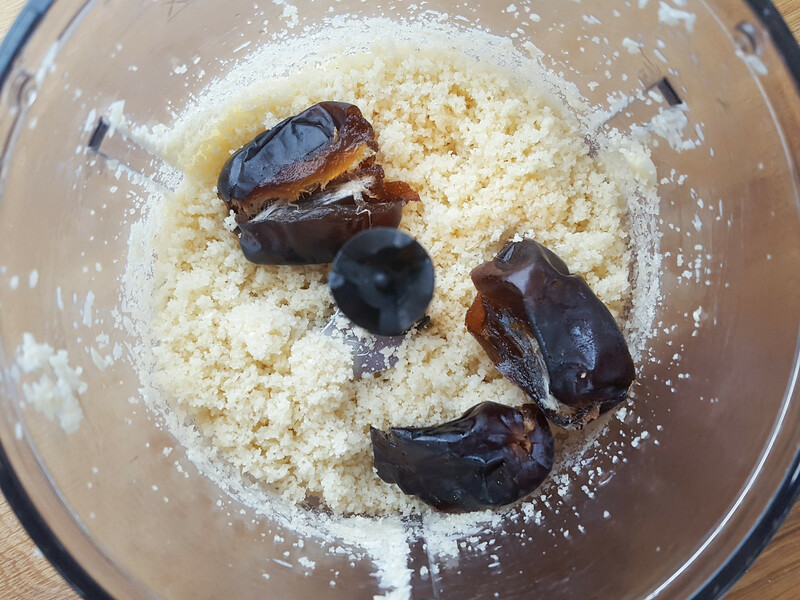 Can dried dates be substituted in place of fresh ones? I haven’t tried this recipe with dried dates. However, I don’t think it will work. I think the dried dates are too ‘dry’. We need the moist to make the marzipan stick together. Great! This is just what I was looking for!! I’m not used to eating a lot of sugar anymore, and bought some nice marzipan treats at a local Danish bakery. The sugar sent my head spinning so I didn’t enjoy it. But I’ve done just fine with ground dates before so I’m going to give this a whirl!!! Thank you! One question, though, where do you find these dates? Are they canned or are they in the produce section? Yes it’s actually great reducing the sugar. I’ve it the same way as you regarding sugar. It’s a good question regarding where to find the dates. It’s my experience that my local supermarket keep finding new spots for the dates. Sometime they are located in the vegetable section and sometimes they are located in the canned food section. I have even found them next to the freezers with meat. I always just ask an employee where to find them :-) I always get the dates which comes in small cardboard boxes with plastic wrapping. Great! I will ask around while I’m at the store so I get the right ones. Thanks so much for your help! Looking so forward to trying this. Is it ok to put a few drops of almond essence in? Further to my last question. Is this suitable to put on top of a Christmas cake.please? There will be no icing. Yes you can absolutly do that. Just found your comments/web side? Anything new let me know. Godt nytår og mange tak. Hi. I currently don’t have a mailing list. The best way of following my blog is “liking” the blog on Facebook or simply by visiting the site from time-to-time. I just linked to this recipe from my Semlor recipe! Thank you! Thank you for this healthy, wonderful, easy whole-food recipe. How does this marzipan compare to almond paste? Some recipes call for almond paste, and I would like to make a replacement for that. What blender are you all using as this recipe won’t work for me in a vitamix! No chance. The stuff just sits in half prosessed lumps under the blades. Highly unsuccessful. I’m using a small hand blender with a small blender attachment. If the dough is sticking to the side, then add a little water. You can also use a tablespoon to scrape the dough from the sides.